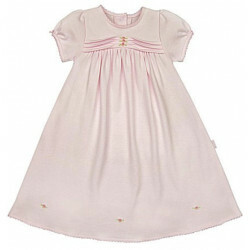 12-24 months girls100% polyester 3 Pc. baby girl PJ's with cute little elephants and lime. 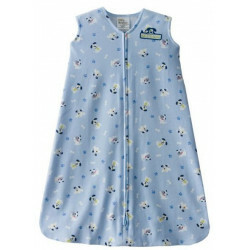 Meets all requirements for baby sleepwear. 100% polyester 3 Pc. PJ's by Little Me. Polyeter because of the coS clothing laws regarding children's sleepwear. The 3 Pc. 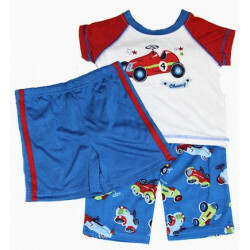 set includes a short sleeve shirt, long pant and a short pant. Cute little girl pj"s. The long pants have elephants of pinks, yellows, turquoise, and lime with flowers and hearts on a white background. The shorts are lime with the dots in the colors of the elphants. the short sleeve top is lime with a pink appliques/embroidered elephant. Sizes: 12, 18, 24 month. 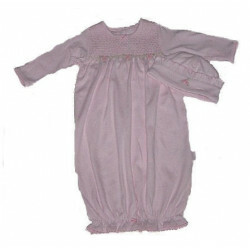 Cute and comfy baby girl clothes.